After our recent blog post reviewing the Gielly Green repair shampoo and hair mask (which you can read here), We were lucky enough to be invited into the salon for a cut and blow dry! We sent lovely London based girlie, Kate Gowing. Kate reports, I went last week and was really excited to see what they would do with my lifeless and very flat hair, and I am thrilled with the finished look - my hair has been given a whole new level of vitality and femininity. 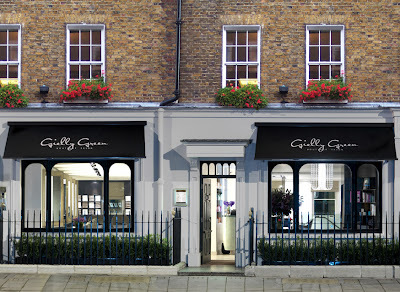 The salon - based on George Street - is gorgeous and chic, spacious with a luxury interior, giving it a sophisticated vibe. Upon arrival I was greeted by really friendly staff, one of whom kindly showed me around the salon. The salon not only offers hairdressing, but also includes beauty rooms with an array of treatments available. Gielly Green has also recently made the addition of a Shavata Brow Studio and Lash Lounge which is very exciting, with threading, tints, lashes and so on available. So your trip to the salon can transform you in an abundance of ways! I had my hair cut by the amazing Fred Gielly, who is without a doubt the nicest guy I have met in the business and it was a real pleasure to have my hair cut by him. Before the cut, I went through the shampoo/conditioner/head massage process (which almost made me fall asleep) using the gloriously smelling Gielly Green products, this was a lovely experience in itself, and in fact I was lying down having this done which made it extra comfy and enjoyable! I was a little unsure of how I wanted my hair cut but I knew I wanted more body and life to it, so I let Fred work his magic and sat watching the transformation. I was so thrilled with the outcome, with the addition of layers and a fringe cut in, my hair had so much more bounce and volume to it, exactly what I wanted. The way my hair was blow dried was something I thought I could never achieve at home, but after my cut the salon told me that Fred had posted a 'how to' YouTube video about creating the perfect blow dry - excellent. You can see the video along with lots more hints, tips and information about the salon here. Loved, loved, loved every aspect of my time in this welcoming and warm salon. Anyone living or passing by London should definitely check it out. I know I will be going back! Where are the before-and-after pics? Hi Guys! Great post and thanks for sharing the experience Kate! Please have a look at my blog if you have time! it would really make my day! Wow! If i ever visit London, this will be a must. Thank you for sharing. So glad you had an excellent experience. 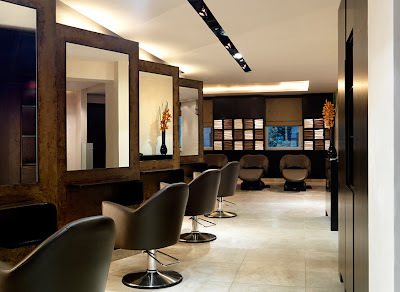 Finding a good salon and stylist can be such a challenge and even a bit demoralizing at times. I am having the worst time finding a good stylist. By good ii mean one that listens and dose what I ask for.